A type of Navajo woven rug which depicts spiritual deities (yei) in designs based on elaborate sand-paintings. The yei style of weaving developed in the Shiprock, NM area the early years of the twentieth century. These rugs are usually small- or medium-sized, portraying front-facing, colorful, slender figures on white or tan backgrounds. Although the yei design represents religious figures, the rugs are not considered sacred objects and are normally used as decorative pieces to hang on the wall, much like fine art paintings. "Yei rug, May 26, 2008" by teofilo is licensed under CC BY. 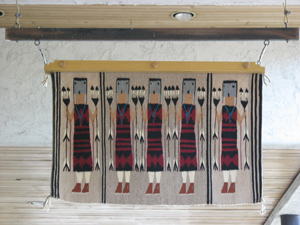 2005 Rugs and Posts: The Story of Navajo Weaving and Indian Trading. Atglen, PA: Schiffer Publishing LTD.